Dr. Baker was very professional and explained very carefully the care I neeeded for nose and throat. I will continue touse Dr. Baker for my needs in the future. Horrible service received. Will not look forward to returning. Was treated like an animal and my insurance was drained.End result was to buy Cortisone cream over the counter for pain in my ears. Sat in there for almost 2 hours and still in pain. Horrible service received. Will not look forward to returning. Was treated like an animal and my insurance was drained. End result was to buy Cortisone cream over the counter for painin my ears. Sat in there for almost 2 hours and still in pain. Dr. Baker is the newest physician at Providence ENT since relocating from downtown Philadelphia in February 2018. 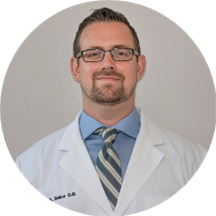 Dr. Baker serves as an Adjunct faculty member of Philadelphia College of Osteopathic Medicine and Drexel University College of Medicine. Dr. Baker completed his medical education at the Lake Erie College of Osteopathic Medicine. Post this, he went on to pursue a residency in otolaryngology, head and neck surgery and facial plastic surgery at the Philadelphia College of Osteopathic Medicine. Dr. Baker specializes in adult and pediatric disorders of the ear, nose and throat. Special areas of interest include Endoscopic Sinus Surgery, Septoplasty, Surgery for Chronic Ear disease, Salivary gland and Endocrine surgery (Thyroid/Parathyroid). Dr. Baker prides himself in providing compassionate patient care to the region and enhanced patient satisfaction. He shares a great rapport with his patients and is known for his medical knowledge and dedication. Dr. Baker is married with three children. In his spare time, Dr. Baker enjoys spending time with his family, golfing, boating and resistance training. Shaun and his staff were very friendly and prompt! It was a through examination and Dr. Baker listened to my concerns.I have no issue with his bedside manner or professionalism. It was super easy to get a next day appointment. I did give him 5 start because I went infor my ear and my prescription was writing for the nose. I am sure that was just a typo. The wait was over 30 min to see the doctor. Kind, compassionate, thorough and professional. Willingly took extra time to listen and respond to my concerns. I highly recommend him. He was so nice and friendly. He listened to every I had to say.